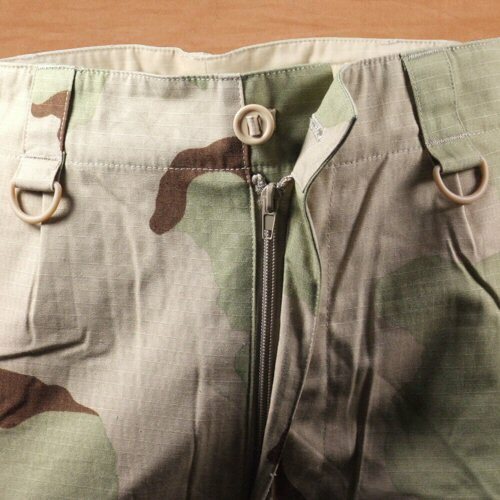 The Bulle US Tricolour BDU trousers, enhanced, are fitted with the latest innovations in tactical wear. 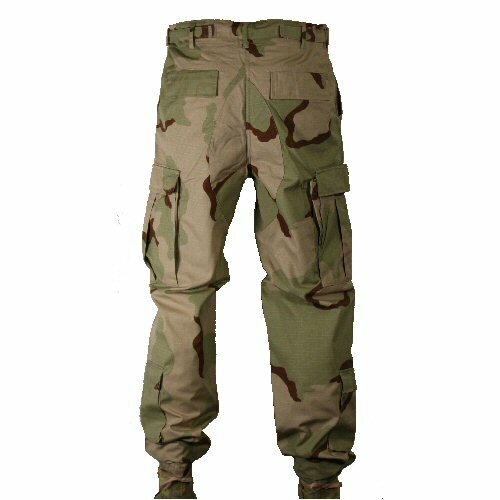 They are made of genuine issue MIL-C-3924J Quarpel treated American cloth which is lightweight, wrinkle resistant, machine washable, ripstop. Quarpel treatment is a water repellent finish designed for military use. 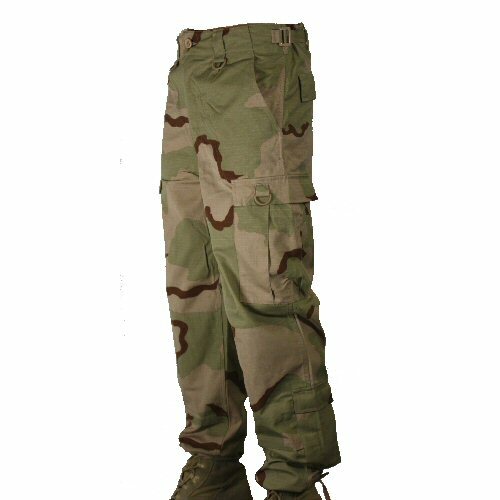 Trousers retain much of the classic 6 pocket BDU characteristics, with the additional features demanded by professionals. 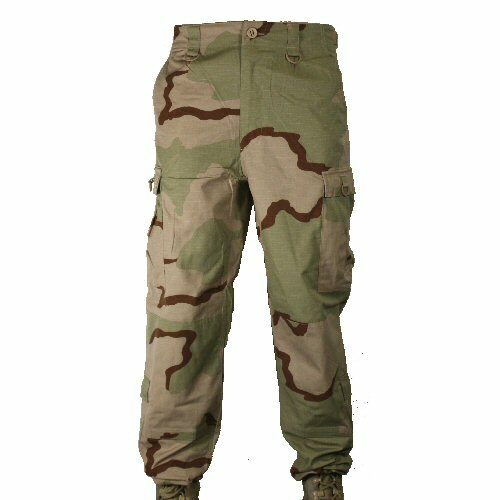 The Bulle Desert Tricolour DCU trousers have the following features: Waist - Slotted button waist and zip fly. Wide 25mm belt loops on the front left and right which support a plastic D-ring. D-rings are in easy access space for hanging keychains, carabiners or other gear. Extra long and wide 25mm side adjustment tabs left and right which are threaded through plastic slide adjuster and fastened back onto trouser with velcro for comfort. These will not open up because of riding issues like the standard BDU metal side adjusters. Normal belt loops on sides are rear. Discreet, pleated front, German Army style, for better fitting on waist and looser fitting around hips. Hip Pockets - standard slash style pockets on left and right reinforced with bar tacks at stress points. Back pockets - hidden back pockets are provided on left and right. These close with velcro to reduce pressure points on the rear. 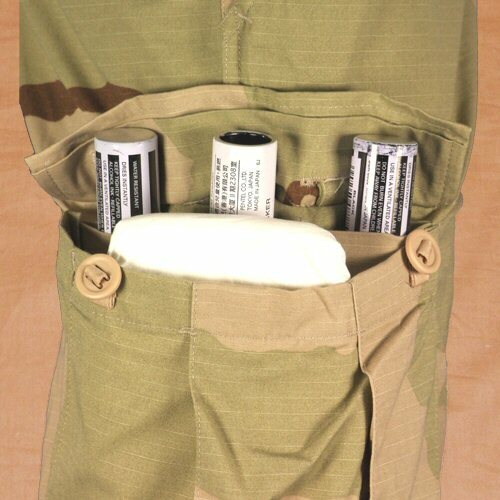 Leg pockets - BDU size pleated pockets expand to hold more contents if required. Pockets are closed with two hidden slotted buttons. 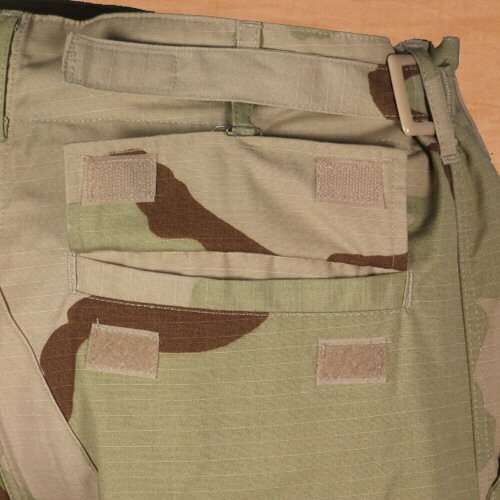 Bottom of BDU pocket is sewn down to prevent the pocket from sagging to the rear and appearing untidy. Each pocket flap also has a retractable D-ring. Right side Leg pocket - large, flat internal pocket is provided, subdivided into three sections. The centre top of the pocket flap is left unsewn for quick access to the contents of the middle internal pocket. This can be used for a penknife, torch, expandable baton (police only), magazine or other long, thin item. Knees - knee reinforcement patches can be opened with velcro and foam protection slid inside to provide protection to the knees. Lower leg pockets - A lower leg pocket is provided on each leg. This is particularly useful for crews who are usually sitting down, or vehicle drivers. Ideal for storing ID or wallet in an easy to reach area. Closes with velcro to reduce weight on the lower leg area. Ankle cuffs - these are fitted with drawstrings in the hem to be drawn tight and bloused over boots if required. Seams - all main seams (up the legs and from crotch to rear) are stitched with tough overlock stitching which is almost tear proof. Seat - the seat is fitted with a large reinforcement patch. Sizes available are: Small (up to 31 inch waist), Medium (up to 35 inch waist), Large (up to to 39 inch waist), XLarge (up to 43 inch waist), XXLarge (up to 48 inch waist). View of rear of trousers. This view shows the side adjustment tabs, the rear pockets, the seat reinforcement, hip pocket, leg pocket and lower leg pocket. Close up view of the right leg pocket. This pocket has an internal pocket which is subdivided into three compartments for holding torches, magazines or similarly shaped items. The pocket flap is open over the middle of the three internal pockets for quick retraction of contents. The flap closes with two slotted buttons. The pocket is expandable with two pleats, and the bottom of the pocket is sewn down to help maintain a neater appearance. The internal pockets help to organise the contents of the pcoket for quick and easy withdrawal. Close up view of the button waist, zip fly and front belt loops. These are fitted with D-rings for the attachment of lanyards or carabiners. Close up view of the rear, showing the extra long side adjustment tabs and the back pocket flaps. These open with velcro, reducing the number of pressure points on the seat of the trousers. Side angled view of the trousers showing the leg pockets on thigh and lower leg.